About a decade ago, we took a drive from Canterbury to McAdam on a gravel road. The memory I have carried with me for years is of a section of woodland absolutely blue with flowers. I often wondered what the flowers were and if I’d be able to find the spot again. This weekend we tried to find the place and the sea of blue in the woodland. 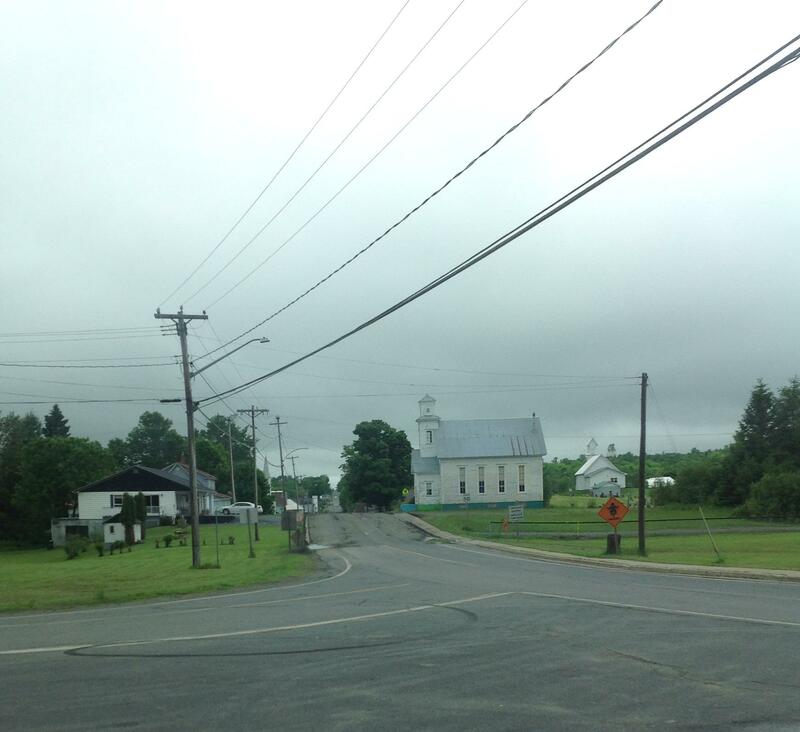 Canterbury, like many rural communities of New Brunswick, has faced a shrinking population over the years. Settled by Loyalists, it was a center for logging and railroad traffic and, in the late 1800s, had a population of over 1000. Today it has only about 340 residents. Nevertheless, it is a charming village and has a newly renovated school, housing all 12 grades. The route from Canterbury toward the south is a numbered road. 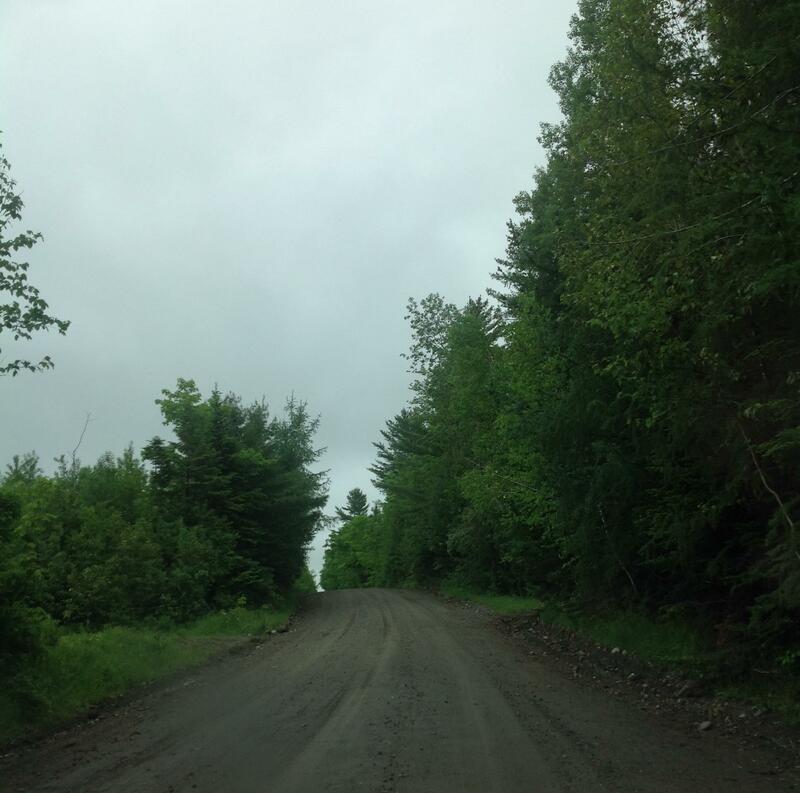 But Highway 630 is not paved and quite rutted in some sections. In one place we had to ask some ATVers if we were on the right road! As we drove, I watched the woods for those blue flowers. Wildflowers were certainly a theme of our drive. 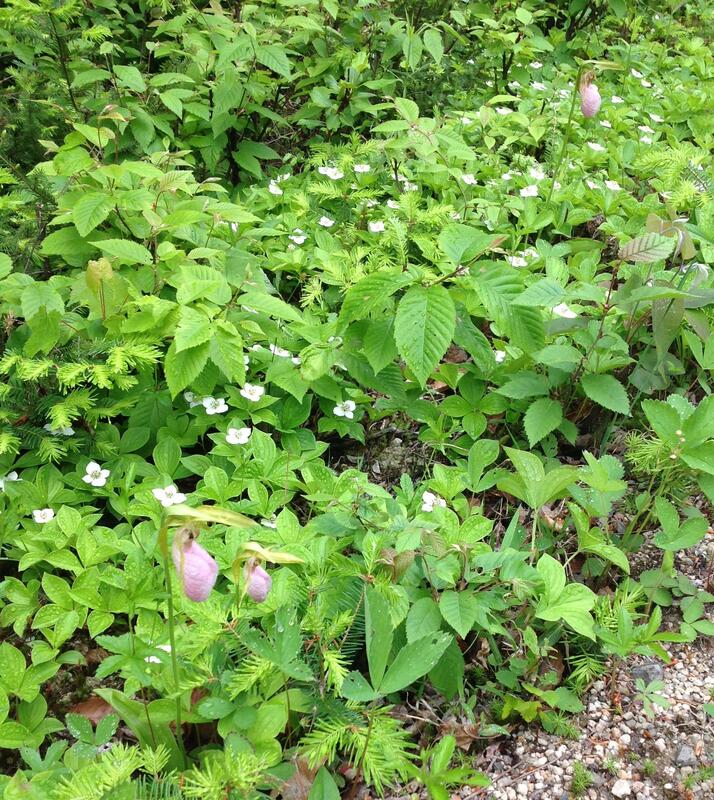 By the road we saw Pink Lady’s Slipper (Cypripedium acaule), Bluebead Lily (Clintonia borealis), Bunchberry (Cornus canadensis) and Quaker Ladies (Houstonia caerulea). 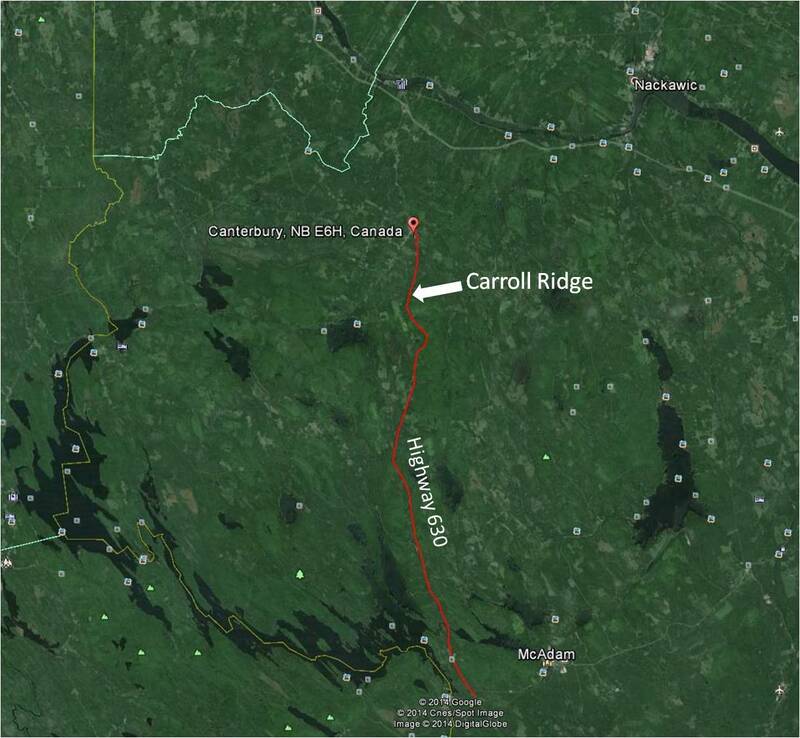 The map shows a community named Carroll’s Ridge just south of Canterbury. When we reached the location marked on the map, there were no homes or buildings, only a few old roads and cleared areas. But there in the woods was evidence people had once lived there. I found my sea of blue! 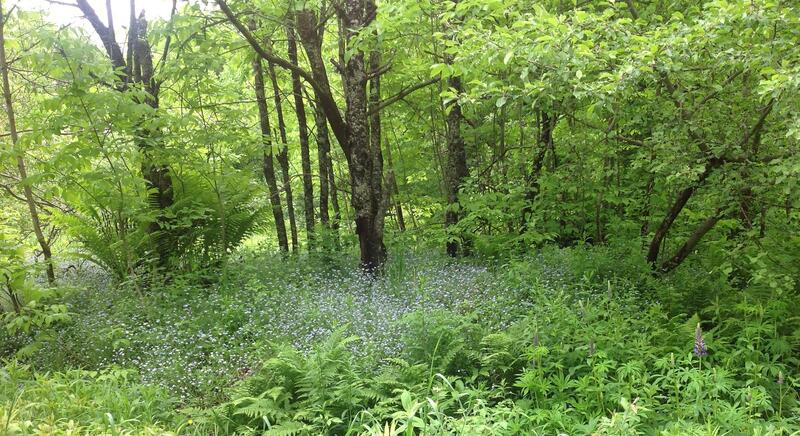 Forget-me-nots, escaped from some forgotten garden to thrive in the near by woods. In my memory, the ‘blue’ of the flowers was more intense a decade ago. But we noticed many of the Forget-me-nots there now are a white variety. Who knows if flower colour or memory really changed during those ten years. I picked a few of the Forget-me-nots, to try an ‘eco-print’ dyeing experiment in coming days. 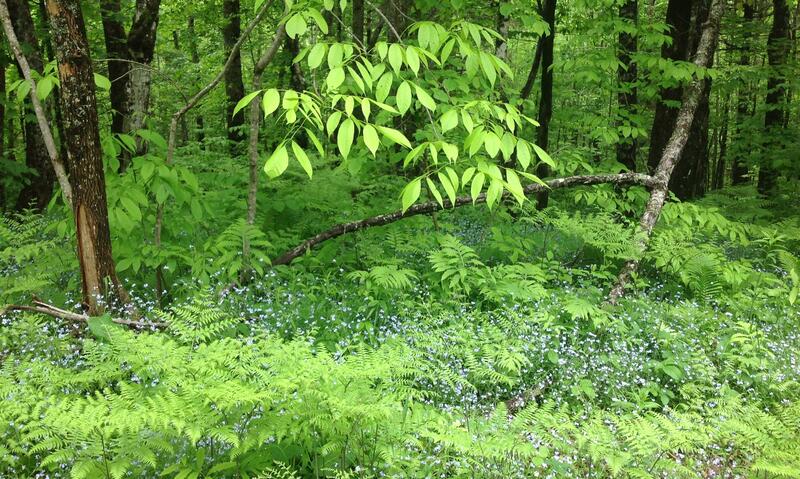 But what I really took away was another image of a sea of blue flowers in the woods. Hi Jane, I have a cottage at Skiff Lake and have driven down the 630 many times. Carroll’s Ridge has an interesting history. If you leave the main road and drive into the old community (accessible now by 4-wheelers), you will see old rubble stone foundations that marked a vibrant community back in the late 1800’s. Then a travelling evangelist came through and converted them to Mormonism. The community packed up, went to Saint John and from there to Boston by boat. They then travelled to Utah overland with many (most) dying along the way. I came across your site looking for images of apple trees and stone walls to incorporate into a hooked rug. Love your drawings and paintings – very inspiring. I have driven that route . . . once. It’s a great shortcut between Passamaquoddy and Quebec, but I recall that feeling of wondering if we were on the right road. The only giveaway was the Tim Hortons cups strewn at intervals! Hi Jane, I would love to do some posts about glacial features, but I am woefully ignorant on the subject. However, there are further posts in the pipeline about NB building stones and tidal flats! The last photo is gorgeous. 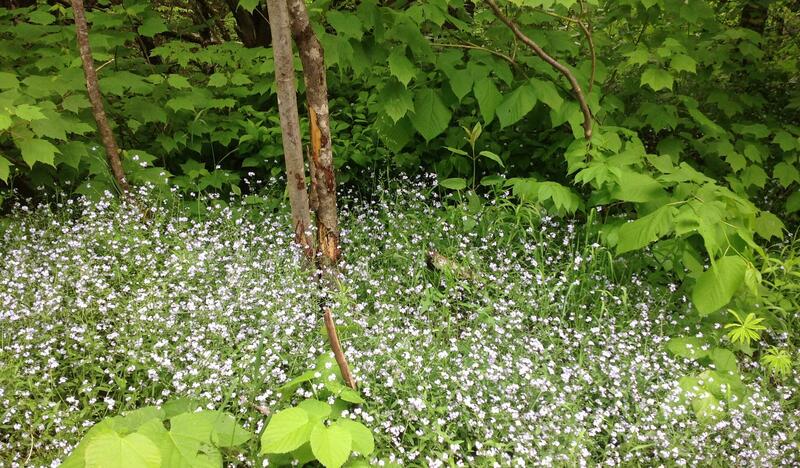 I love forget-me-nots and have swaths of them in spots in my yard. Some treat them like weeds and pull them all out but I love the pale blue haze and the notion that they will last for years and beyond me as well. Your blogs are so well composed, so informative with great photos. I look forward to each one.